One key feature of our Leading Edge Landing Lights is the ability to easily upgrade them. 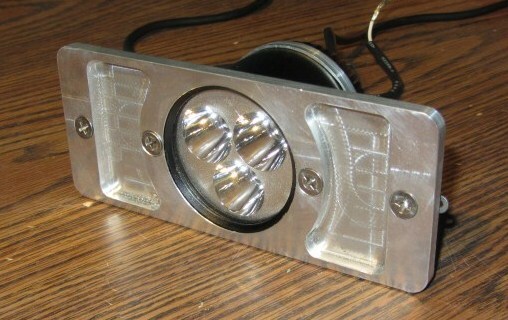 This page contains Optional Lights and Upgrade Kits to convert one style to another. As of Sept 22 2016 these lights are No Longer Available. 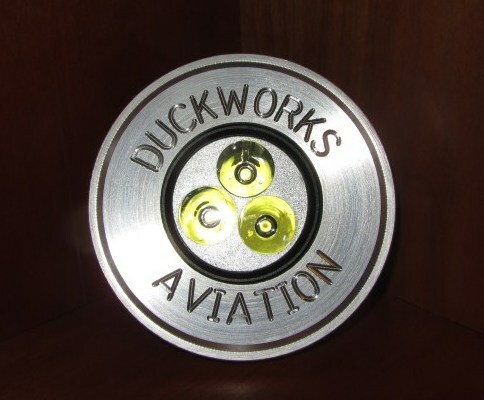 Duckworks LED lights. The benefits to LEDs are mainly the very low power draw and long life, but also they are very bright 'to look at', making them good for recognition as well. These lights Upgrade both our Round and Rectangular Kits, using an adapter plate (supplied with the new LED Light). NOTE - beginning in April 2015 the LEDs in these units are 20% brighter than before, and we added a circuit to allow flashing them with a simple and inexpensive Flasher (see pics to left). The Updated units are easily identified - they have a 3rd small gauge wire (the earlier units only have 2 wires). This LED Light Designed and Built in the US! These Lamps will fit in the Rectangular and Round Mounts and replace those lights with a very bright, long Spotlight that draws less than 1 Amp. Very low power at 9w vs 55W or 100W! This light uses a low cost 100w Halogen Bulb in a 4-inch "PAR 36" reflector, which is the same 'size' reflector as our HID units, and gives builders the option of a Round H3 light. This Upgrade Kit is intended to convert a Duckworks Rectangular 55w installation to the Round 100w unit. These are the reflectors (without Bulbs) that come in our Rectangular 55W Kits. These are 4-inch "PAR 36" reflectors (without Bulbs). 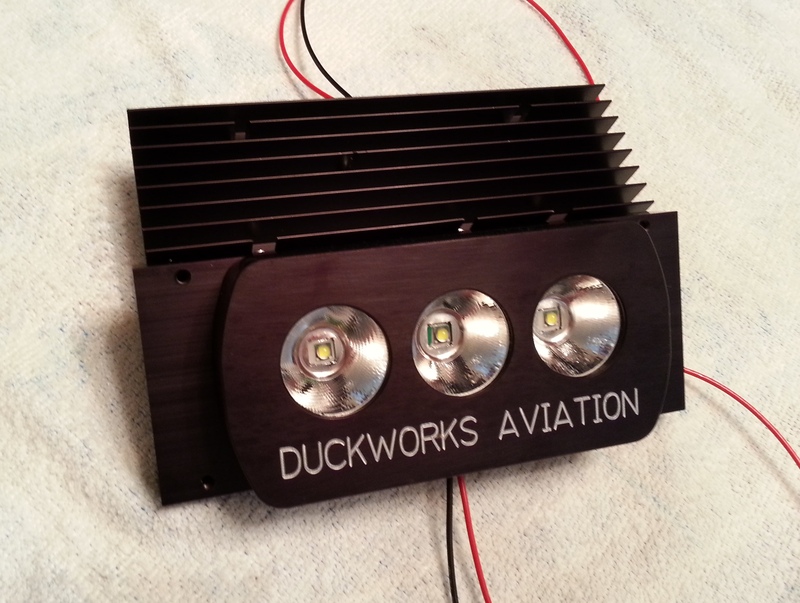 Duckworks offers High Intensity Discharge (HID) lights with a lamp that is a direct fit for our standard Rectangular and Round Reflectors. You still get the benefits of HID - incredible amount of light output, reduced power draw, and long life. NOTE - These lights have the igniter built into the ballast not the bulb, which helps with the cost. Some customers have reported a slight whine in the audio system during the first 10 sec. Once the lights are warmed up, at most 10 seconds, any whine that might have been audible will be gone in all cases. Wig wag flashers will not cause any interference as long as the systems were warm prior to flashing. For those with limited Alternator capacity, replacing your Halogen Lamps with these units will definitely help. Please note - We DO offer these Lamps in Kit form for Leading Edge installations. In keeping with our agreements with Van's, we don't sell the 50W full installation kits - you should get them thru Van's Aircraft. Units come with mounting screws and instructions. This Unit is more powerful, but does draw more power. It does project it's light farther. Note - this is only the Lamp and Ballast for use when replacing an existing H3 halogen bulb. May not be compatible with wingtip antennae installations.